Arriving in Uganda for the second time I felt even more anxious compared to my first trip in 2009. I had a new role this time working with six amazing medical students and my mentor Dr Elguero. Would I be able to live up to their expectations? Will the need be even more this time around. Well this was the question and I would have my answer soon. I was the only black doctor in this group of physicians. I figured I would have a different perspective of the people of Ddegeye village. 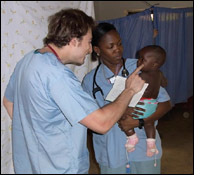 We worked in Engeye Clinic which was founded by Dr Stephanie Van Dyke and an incredible Ugandan John Kalule. The first day the team woke early in the morning but it seems the patient woke even earlier. There was already 15 -20 patient waiting outside the clinic they all had heard the American doctors were here. During this trip I served to preceptor for the medical students. There were new services implemented this year which included dental care and more preventative care for parasitic infections. Fluoride resin was applied to the teeth of every child that came to the clinic which was over 500 children. They all received a toothbrush which they all were so grateful for. The overwhelming diagnosis at the Engeye clinic was Malaria using rapid blood testing for Plasmodium falciparum which is 98% cause of malaria in Africa. Uganda Cares, a local organization that does free HIV testing and treatment, came to our clinic for HIV testing and referral for follow care if necessary. It was incredible to see how stoic the people of this community were. Even with the new diagnosis of HIV. There were no tears no panic in there eyes. They took it in stride and I wondered if this was because they had some idea of their status or if they know that no matter what they have to keep going. This is a culture of strength, resilience and compassion. This entire trip was beyond my expectations. There is definitely an improvement in the health of this village. In the clinic we are seeing more chronic medical conditions and less acute urgent care needs, which tells me that when we are not there the medical management guidelines put into place by Dr Elguero are working. Medical care is given by the nurse who staffs the clinic and the MD that comes to clinic weekly. I felt privileged to serve with these wonderful medical students and Dr Elguero, a brilliant, amazing and selfless person who I hope to be like one day. I am looking forward to a career where I can continue to do my part in improving global health.